The ASPIRE committee has been gathering the reflections forEmmanuel's self-published lenten booklet. Bountiful Spirit, will be available on Sunday ,March 3rd, before Ash Wednesday. 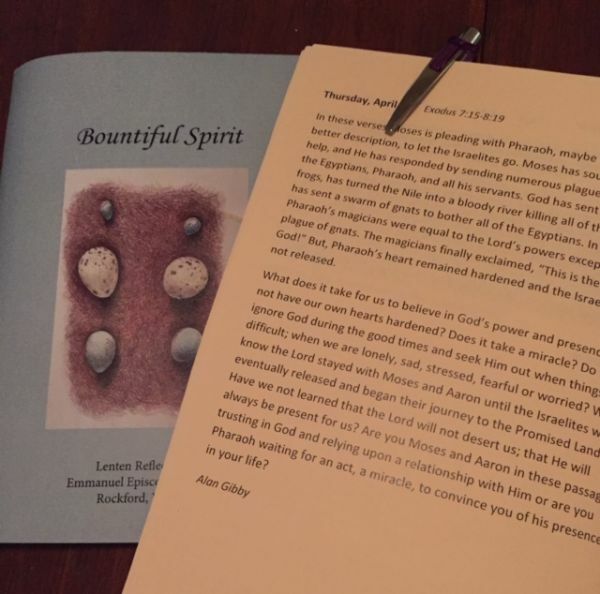 Not only you will find inspiring reflections from congregants, but you will also discover that the booklet is a guide to services and activities during Lent. Another big plus is that David Hatch has prepared sketches of symbols and architecture in the nave. You might want to think of college students, family living away from Rockford, or a friend who would enjoy copy of the booklet. Lay Eucharistic Ministers will carry the booklet to shut-ins.